As you drive up and catch a glimpse of the stunning long range mountain views and skies of color that paint the sunset, you still won’t grasp just how exceptional this cabin really is. Once you step into the professionally decorated cabin with wooden cathedral ceilings, a plush leather sofa and love seat, a one of a kind, live edge dining table and a wall of windows overlooking the mountain range, then, maybe then, you will know what an amazing cabin this really is. Sit back and relax, you’ve found your happy place. The main level of the home offer’s 2 bedrooms, 1 with a king bed and 1 with a queen bed, and a full bathroom. An open living, dining and kitchen with granite counter tops and updated appliances complete this main level. The kitchen is fully equipped, ready to prepare your favorite meal. There is a 55” TV, Blu ray DVD Player, and Bluetooth speakers in the living room. Each bedroom also has a television. It’s just perfect for any family gathering. A wood burning stove makes the ambiance of this home even more inviting. The kitchen opens onto the upper porch where there are rocking chairs, a picnic table, gas grill and access to the screened in porch with a hammock for an afternoon siesta. We haven’t forgotten your fur babies, there is a fenced yard just for them. Step down into the lower level of the home and you’ll be welcomed by a quaint living area with seating, a gas log fireplace, Nintendo Wii & games, Blu ray DVD player, Nintendo classic game system, a 42” TV, and a gas log fireplace. This area opens onto the lower deck complete with a Hot Tub and access to the outdoor Fire-pit. A wet bar/game area adjoins the lower living area with an electronic dart board, arcade game, popcorn machine, toaster oven, coffee maker and a small refrigerator. On this level you will also find a full bathroom and two additional bedrooms. 1 bedroom has a king bed and the other has two twin beds. The home also has Free Wi-Fi, Direct TV and a Washer and Dryer for your convenience during your visit. 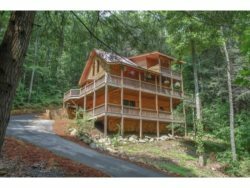 Located just minutes from the quaint mountain town of Blue Ridge GA, this is a GREAT location for those who want to experience everything in the mountains. The outdoor activities are endless where Hiking, Kayaking, Tubing, White Water Rafting, Paddle Boarding, Horseback Riding, and Zip-lining are all right at your fingertips. You can hike to several Waterfalls, hike to the Swinging Bridge, or take a more relaxed approach and enjoy a great meal at one of the many wonderful restaurants or breweries. Don’t forget to take a ride on the Blue Ridge Scenic Railway, be entertained at the Big Foot Museum or step back in time at the local Swan Drive-in Theater. There is something for everyone in the mountains! GAME ROOM/WET BAR AREA - Electronic Dart Board, Arcade Game, Popcorn Machine, Toaster Oven, Cofee Maker, Small Refrigerator, Access to Lower Deck with Hot Tub and outdoor Fire-pit.